Long before it was “discovered” by John Cabot in 1497, Newfoundland, with its vast quantities of oversize codfish and thousands of whales, was the well-kept secret of Basque fishermen. But there’s another secret about Newfoundland being kept from most modern-day mariners: It’s an ideal summer cruising ground. Whales often feed close to shore. 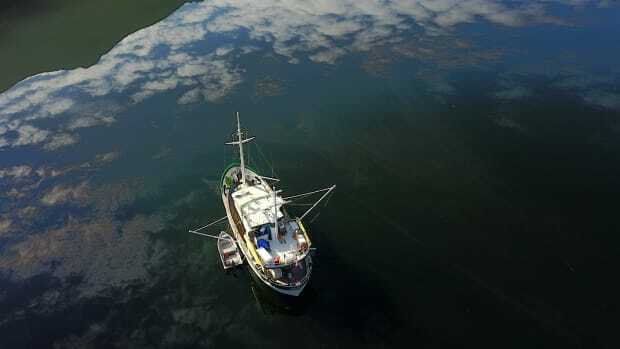 Boaters who have gone down east to Newfoundland typically downplay the ease of getting there, preferring to tell tales of lousy passages, fog-enshrouded waters, and dangerous ice. Yet Newfoundland’s impressive southern fjord coastline is just 65 miles, or a day’s hop, from Cape Breton, Nova Scotia. The crossing of Cabot Strait is within sight of land the entire way because both shores are mountainous. 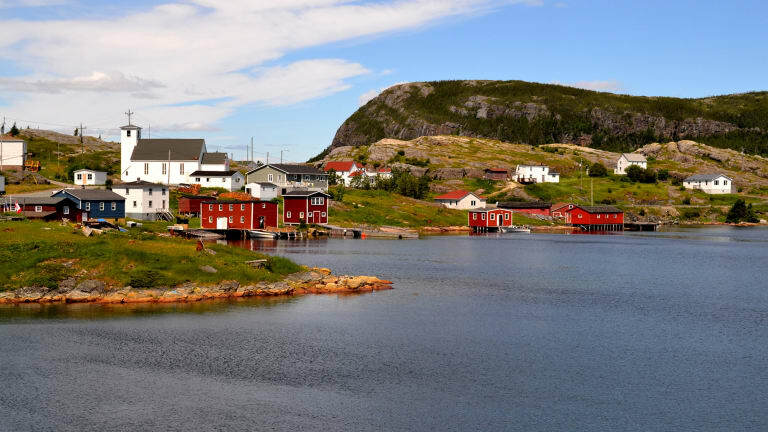 For those who know little of Newfoundland, the time has come to enlighten you about her wondrous sights and the kindly nature of her people, both of which make it an excellent cruising destination. As the largest island on the eastern seaboard of North America, it simply begs to be explored. But first, let’s touch upon the weather, another well-kept secret. The best weather window falls between August and early September when daytime temperatures range from 68° to 85°F and the fog moves offshore to the Grand Banks. Shorts, T-shirts, hats, and sunscreen are the uniform of choice. July can be pleasant but it is a transition month: Be prepared for the possibility of cool, damp days. Summer winds are lighter from the southwest, but by late September expect the breeze to kick up and shift to predominant northwesterlies. Newfoundland’s coastal villages, known as outports, are not just unique; they’ve actually become endangered. Prior to the government’s re-population program that was started soon after Newfoundland joined Canada in 1949, there were thousands of small, isolated fishing communities. But the government program (active between 1954 to 1975) set in motion a shift in the outward face of the island. Outport people were relocated by the thousands to large ports that had road access. Shutdowns due to cutbacks in ferry service, the cod fishery moratorium, and general depopulation still threaten the handful of remaining outports, primarily located on the southern fjord coast. These ports are La Poile, Ramea, Francois, Gray River, Gaultois, and McCallum. 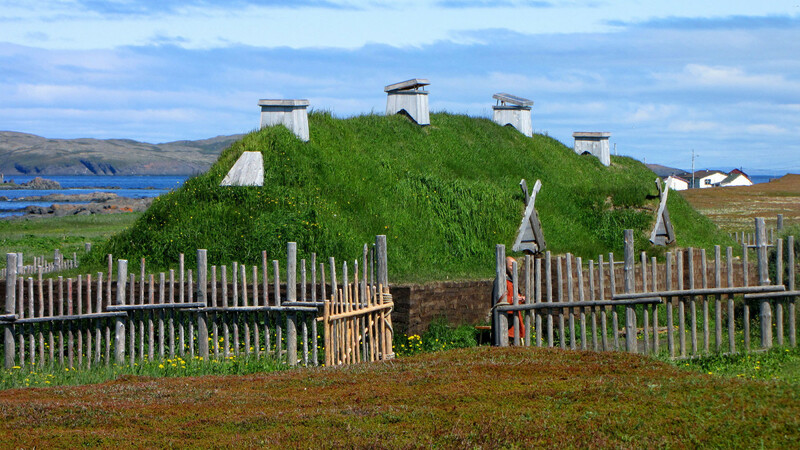 A Norse sod longhouse at L&apos;Anse aux Meadows. This is the only confirmed site of Viking/Norse settlement in North America. Little remains of the communities that were closed down long ago. When cruising through the fjords and “tickles” (narrow channels) on the spectacular south coast, you’ll pass cemeteries on grassy hillsides populated with tilting white headstones—an eerie sensation. 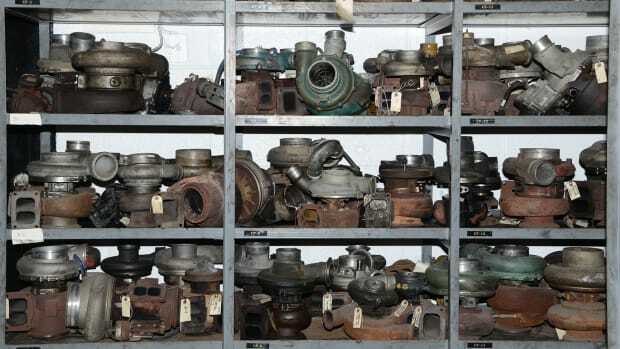 A walkabout may uncover artifacts, such as rusted iron rings fastened to bedrock. Tie-downs such as these were needed to ensure that fish houses and homes didn’t blow away during wild winter storms. During resettlement, homes were unlashed and floated to new sites, leaving only these eyebolts as a reminder of a once-thriving fishing village. 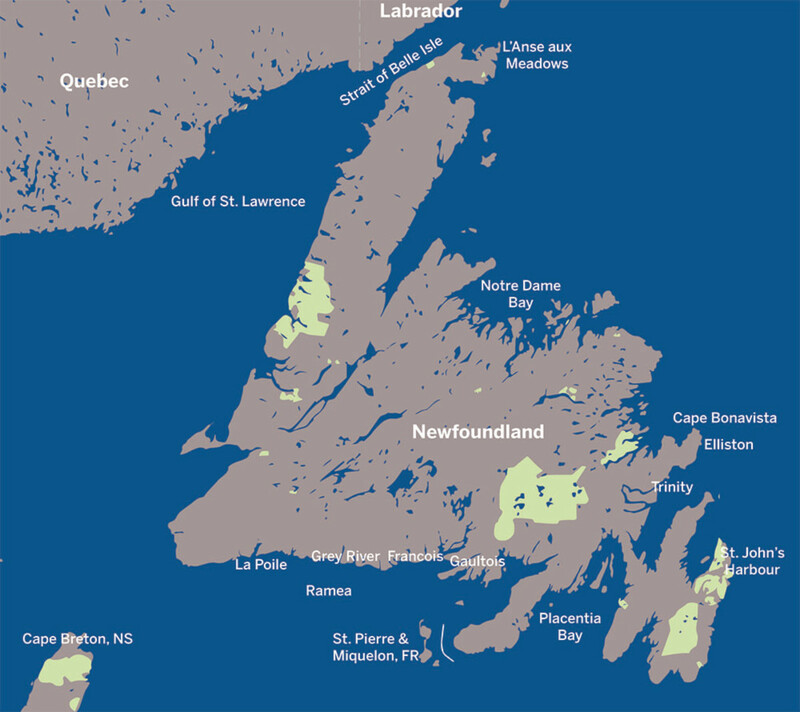 For cruising boats, there are few marinas in Newfoundland. In most places, you can simply tie at the town dock. (Yellow paint indicates that the berth is public.) 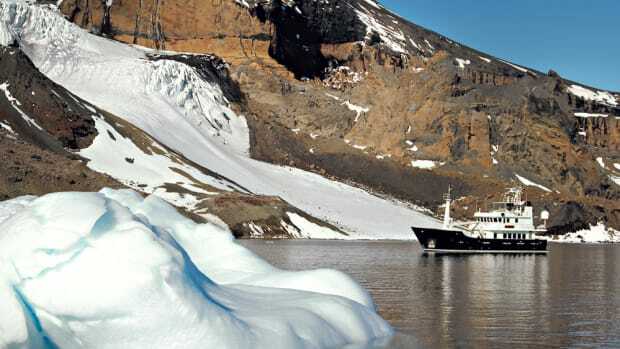 When exploring deep within the wild fjords, though, anchoring can be a challenge. 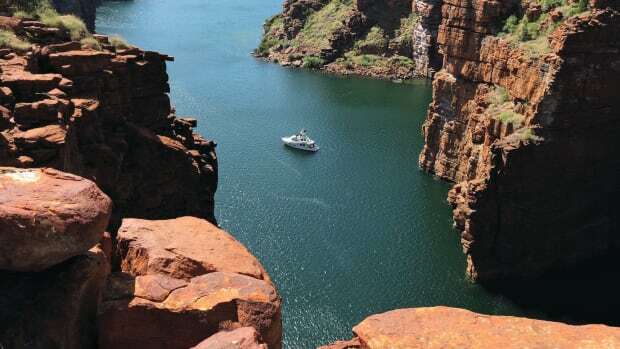 The waters run deep, so come prepared with excess anchor chain and line. Look to the head of a fjord where depths are more suitable. Newfoundland’s fjords are narrow, some are less than a quarter-mile wide, with sheer rock walls that tower 1,000 feet above you. Beware of “blow-me-downs,” strong nightly winds that fall off the tableland and funnel through the fjords. Always ensure a well-set anchor before turning in for the night, or keep a watchstander if you’re at all uneasy. A more extensive cruise can take you beyond the southern fjords to places like Placentia Bay and Notre Dame Bay. En route, your primary stop is St. John’s, the provincial capital. Located on the Avalon Peninsula, this 500-year-old city (the oldest city in North America) retains much of its historic charm and character while offering the amenities and culture of a contemporary city. The tightly packed wooden row houses with quaint, old-fashioned chimney pots (think Mary Poppins) line the hilly streets that rise from the harborfront. They are painted bright colors, which led to the nickname Jellybean Rows. A walk around the harbor brings you to The Battery where a jumble of houses clings to the cliffs. Follow the trail that winds up Signal Hill to Cabot Tower. This fortress-like stone building marks the entrance to St. John’s Harbour and is visible from well offshore. It was here that Guglielmo Marconi received the first transatlantic wireless message in 1901. 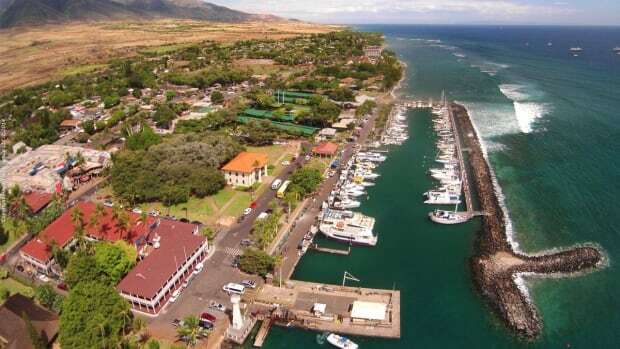 The view over the harbor is impressive, and you may even spot whales feeding just off the entrance. 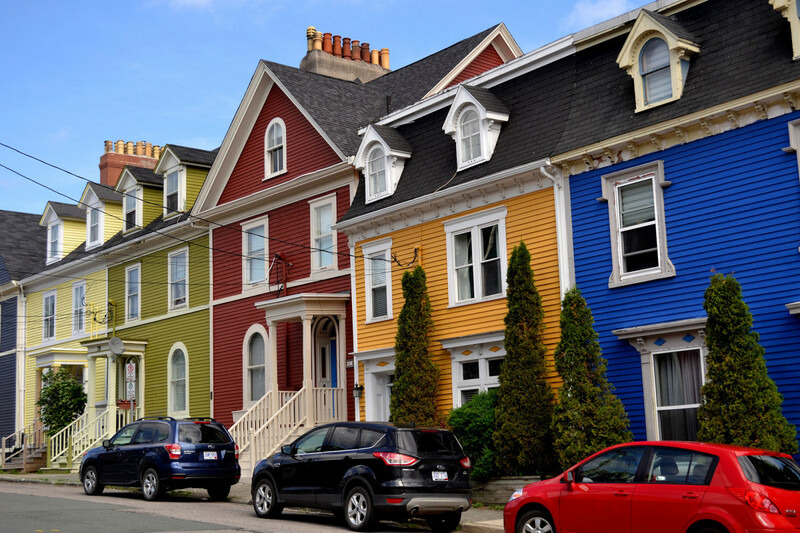 In St. John’s, tightly packed rows of colorful houses are known as Jellybean Rows. George Street is renowned throughout Canada. The short alley-like street is lined with pubs and alehouses—a good place to try Iceberg beer. This light brew (made with iceberg meltwater) comes in an iconic blue bottle and is only sold in Newfoundland. Don’t stay too long or you’ll end up being “screeched in,” an age-old initiation whereby newcomers must kiss a cod to become an honorary Newfoundlander. On Placentia Bay stands the Old World town of Trinity. 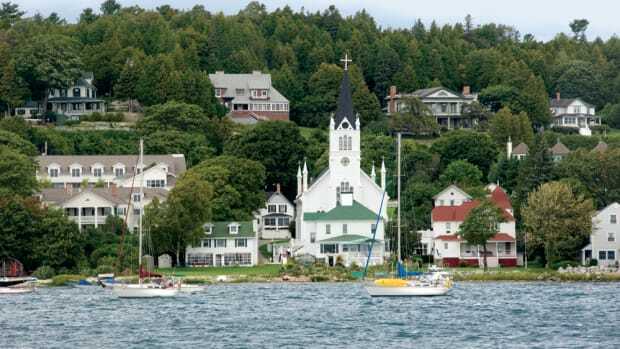 It is one of the island’s more striking coastal villages—a beautiful reminder of a bygone era. Trinity has a nice little marina with a fuel dock. Getting fuel in Newfoundland is not difficult, but in most locations expect to have it trucked to the town dock. 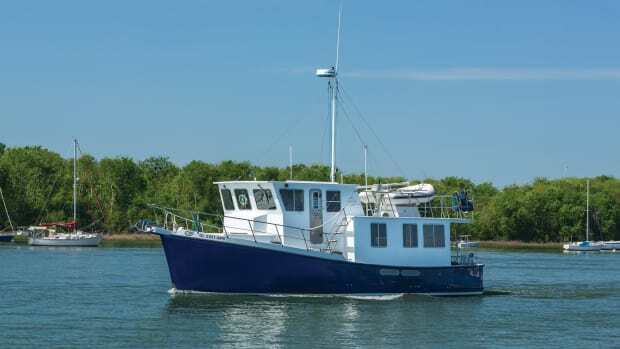 Arranging a fuel delivery is easy once you find the right person to ask, namely the friendly harbormaster. Notre Dame Bay, on the north coast of Newfoundland, is on Iceberg Alley. 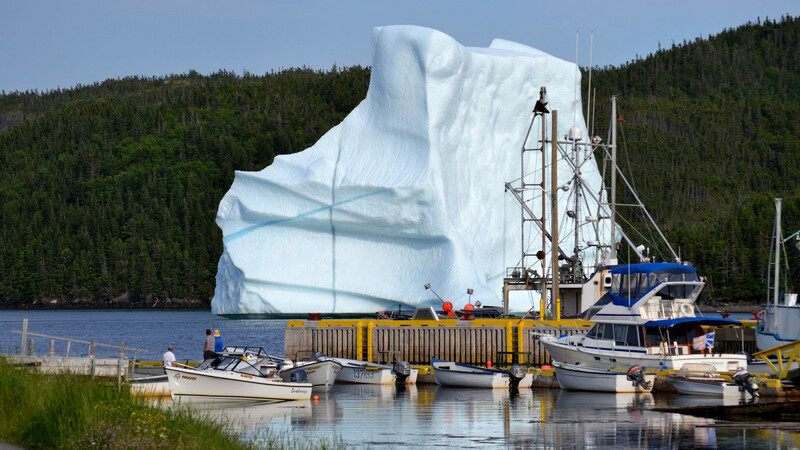 Iceberg season in Newfoundland runs from spring to early summer, with the height of the season being April to late May (somewhat later as you move farther north). The 2017 season was a busy one, continuing well into July. By the time we arrived more than 1,000 bergs had been counted drifting south. An iceberg invades a small port. These icebergs are gigantic hunks of prehistoric ice that broke free from Greenland’s western glaciers. Once caught by wind and current they are driven south past Labrador and Newfoundland, a journey that takes two to three years. Though some bergs get pushed into the Strait of Belle Isle and melt in the warmer Gulf of St. Lawrence, the majority drift through Iceberg Alley and melt in the Gulf Stream waters southeast of Newfoundland. It must be noted that icebergs are rarely seen on the south coast. Icebergs can weigh hundreds of thousands of tons, display an array of shapes and sizes, and range in color from the whitest white to the bluest aquamarine. They often run aground well off the shore, leaving inshore waters generally clear for traffic. If you encounter one, though, you’ll find even the smallest iceberg so fantastic and intriguing that it’s hard to look away. An International Ice Patrol, which includes the use of surveillance flights, was set up after the sinking of RMS Titanic in April 1912. It tracks icebergs and provides mariners with important data, and the website is updated frequently during peak ice season (www.ec.gc.ca/glaces-ice). Click on the East Coast link to get a list of reports and scroll down to “Daily Iceberg Analysis Chart.” The patrols also watch for polar bears that occasionally hitch a ride across the strait to Newfoundland. When spotted, they are quickly and humanely transported back to Labrador. Under clear skies, icebergs are visible from a great distance. Should you, however, find yourself navigating near an iceberg, safety is a priority. Keep in mind that only the top 10 percent is visible above the water, leaving a significantly larger area of submerged danger. In addition, icebergs are unstable and unpredictable, as they roll frequently, and there is risk of falling ice that can create large waves. Ice that falls off an iceberg is known as “brash ice” (small crushed pieces of ice) or “bergy bits” (larger ice chunks). Brash ice and bergy bits can drift away from the iceberg, but they, too, are highly visible and usually easily avoided. One can dip-net brash ice and use it in evening cocktails. Listen for the pop and fizz as the melting ice releases ancient air bubbles. 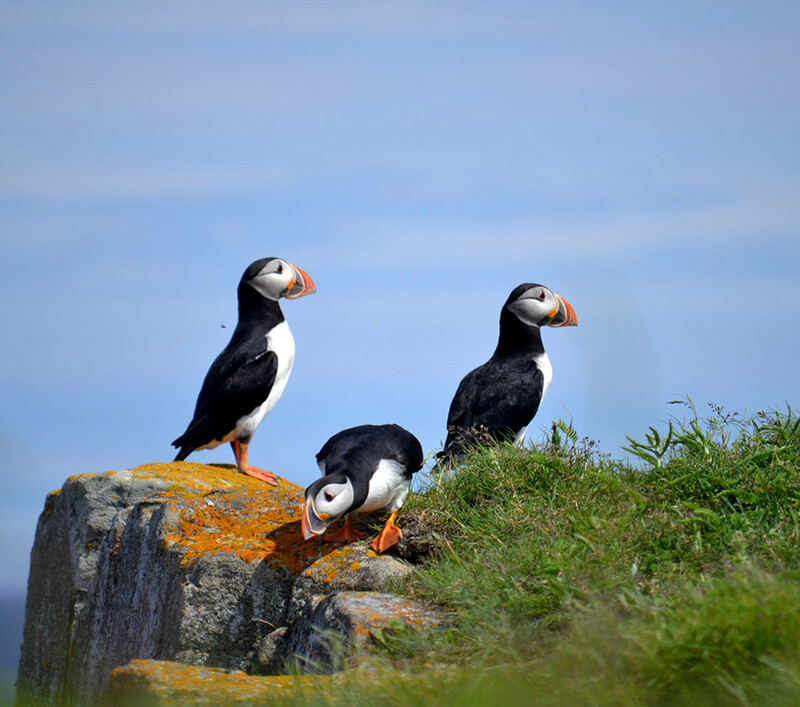 A trio of puffins surveys their surroundings near Elliston. Not far from Cape Bonavista, with its beautiful red/white lighthouse and views over Iceberg Alley, is Elliston, home to a noteworthy Atlantic puffin nesting site. Newfoundland has a number of impressive and very accessible seabird colonies. At Cape St. Mary’s Ecological Reserve on the south coast, a trail leads to within 30 feet of the rocky stack (island) where an estimated 24,000 gannets nest. When in flight, the gannets create a dense blizzard of bright white, and the thousands of birds that remain on their nests continue the loud cacophony. At Elliston, puffins dominate the rookery but seagulls stand by for a free lunch. This is why puffins lay eggs inside burrows on steep, grassy stacks. In the clear blue water around Newfoundland’s coast, seabirds feed on schools of capelin and other small fish. Whales feed on the same food source and often come near shore in late spring and summer. Newfoundland is on their annual migration route to the Arctic. More than a dozen whale species frequent these waters with humpbacks, fin, and minke being the most common. 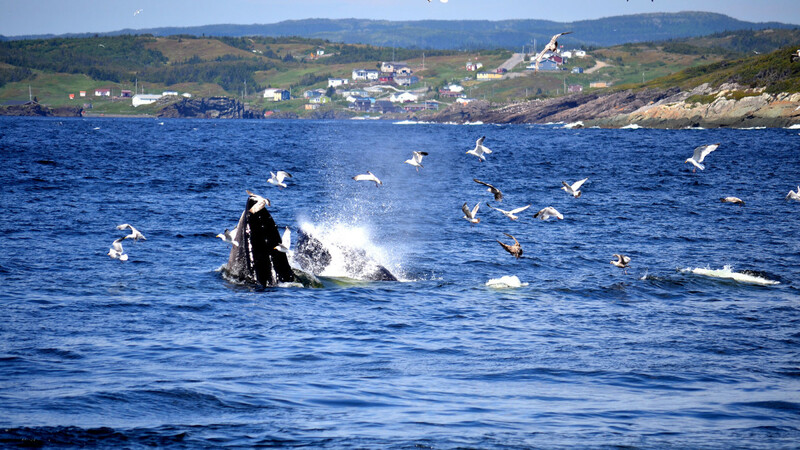 During the annual capelin run (with the fish spawning on the beaches), whales will execute amazing acrobatics while chasing their prey. 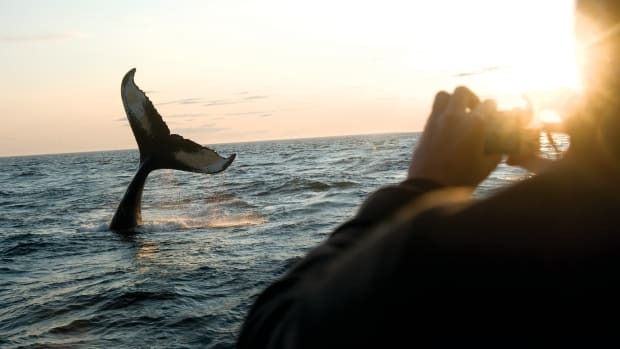 During poor capelin years, such as 2017, humpbacks will feed just one wave away from the steep beaches allowing viewers an up-close show. All this, of course, is just the tip of the iceberg. Cheryl Barr is a cruising guide author. Titles include The Down East Circle Route, The Canadian Maritimes, and Cuba Vol. 1 (Western Cuba). Barr resides in Nova Scotia, Canada.